Bernadette Black was only 16 when she unexpectedly became pregnant. She was living in Melbourne with her parents, devoted Catholics, and two siblings and she wasn’t sure what to do. Her situation grew more difficult when she experienced first-hand the stigma and lack of support associated with a teenage pregnancy. As a result, Bernie established the Brave Foundation in 2009, a not-for-profit organisation that equips expecting and parenting teens with resources, referrals and educational opportunities for achieving a happy and healthy family. The national charity connects expecting and parenting teens with more than 500 outreach and educational services that exist to support them. Such connections to local support “builds a village of acceptance around them and helps them have the same outcomes that any other young person in Australia would have,” Bernie says. Brave Foundation’s website also provides advice for young men, families, friends and professionals who are involved in a teen’s journey. Bernadette Black (centre) with ADM Chair of Board Jenni Stoddart (left) and ADM CEO Dr Kate Harrison Brennan (right), at the ADM Annual Funding Event in September. 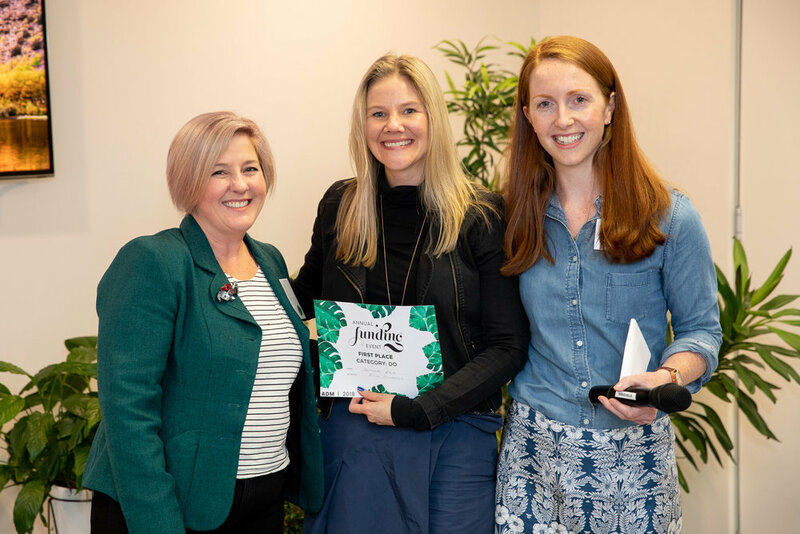 Thanks to this vision for supporting teens through the Brave Foundation, Bernie recently won the “Do” category and a grant at ADM’s Annual Funding Event in September 2018. She expects to use the grant for develop her leadership skills as she takes the Brave Foundation into its next phase. The funding she received through ADM enables her to attend an intensive leadership program at the Harvard Kennedy school in Cambridge, designed to help women advance to top positions of influence in public leadership. Bernie says this will enhance her ability to influence policy in helping people experiencing heightened vulnerability in Australia and beyond. While Bernie is thrilled with the opportunity this funding provides, she acknowledges it’s a long way from where she started. At 16, she promised herself three things: to be a good mother, complete her education, and write a book to encourage others in her situation. That book, Brave Little Bear, is the story of Bernie’s experience as a teenage mother who goes on to qualify as a registered nurse and become the Barnardos Australian Mother of the Year. Written in 2006, the extraordinary response to the book became the catalyst for the Brave Foundation. After its launch, Bernadette received emails from expecting and parenting teens Australia-wide asking where they could finish their schooling and find local support. Bernie says her Christian faith has underpinned the journey from talking about her vegemite-smeared manuscript in churches to running a national foundation she hopes will grow in impact and resources in the $20 million mark. But Bernie’s vision didn’t always look like it would come to fruition. In fact, she lobbied federal government for 12 years for better support for expecting and parenting teens while exploring ways to improve their lives before her work was recognised. Finally, following 12 months of particularly intensive lobbying, the Brave Foundation was invited to develop a best practice strategy for expecting and parenting teens in Australia. Bernie and her team worked for 18 months with 30 people – including psychologists, nurses, school principals, federal and state children's commissioners and members of parliament – to create a 380-page document outlining a national pathway plan. It worked. Last year, they were awarded $4.5 million to implement it. Bernie says that this lack of clear direction has led to 79 per cent of teen parents ending up on long-term welfare. But when young mothers are supported, they are “incredibly resilient and resourceful” and enabled to reach educational goals or enter the workforce. In turn, this helps break the generational cycle that can happen with the children of teenage parents becoming teen parents themselves, Bernie says. Find out more about the 2018 Annual Funding Event here.